Man-Serpent Greatsword - A very popular choice of weapon! MSG is upgradeable to +15 and easy to get pretty early on in the game. It has A scaling for strength (when upgraded), isn't too slow, and has a weight of 10. These are labeled "good" because they are an alternative weapon that is worthy of being mentioned. Black Knight Greataxe - The BKG is faster than normal greataxes. 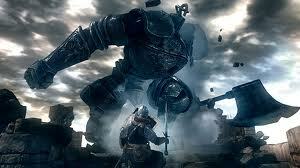 However, it is nerf'ed a bit in the PC version of Dark Souls so that it does less damage. Don't get me wrong though -- this weapon is still powerful and has a large hit radius that makes it worth using. B strength scaling. Dragon King Greataxe - The DKG is pretty darn strong! It has a special two handed attack as well -- a ground smash attack that has an area of effect (AOE) which is great for PVP since it burns up their endurance. This attack does lower the durability by 50 each time though -- so be sure to repair it. It upgrades to +5 for a base damage of 570, but unfortunately has no stat scaling at all, which is its biggest weakness later in the game. It can be enchanted though. Black Knight Greatsword - The BKGS is good EARLY on in the game (during playthrough 1) since it is obtainable in the Undead Parish. Otherwise it would not be on this list. A good alternative to the Drake Sword early in the game. B scaling at +4 and +5. Demon's Great Hammer - You can obtain this if you beat the Asylum Demon during your first encounter with him (her?...it?) so potentially one of the first weapons you get in the game. It weighs 22 though and requires a lot of strength to use. Additionally, you can trade a sack to Snuggle the Crow to get this weapon. Oh, also it has B scaling. I have this section to answer questions for people wondering why weapons suggested to them by others may not have made it on this list. Dragon Greatsword - Although the DGS has the highest base damage in the whole game and has a special R2 attack that does a shockwave, it is not on the list. It has NO scaling at all and cannot be enchanted. You can upgrade it to +5 for 585 damage using Dragon Scales, but...I wouldn't bother with it. Zweihander - Not ideal for strength builds, but does have its perks! It has a faster swing speed than normal ultra greatswords and only has a weight of 10. Not worth using though for those focusing on strenth...Even after upgrading it to +15, the strength scaling is only a C (although it does have a dexterity scaling of D as well). Maybe for a hybrid strength and dex for a strength / quality build, but even then a better alternative exists...Now, what this weapon is popular with is elemental effects. Consider creating a Lightning Zweihander (nerfed on PC I believe though), Fire Zweihander, or Chaos Zweihander. An Enchanted Zweihander isn't bad either if you have a lot of Intelligence, as the strength requirement is only 16 when two handing. Golem Axe - It has a special R2 attack that does magic damage, but otherwise it's awful. Weighs too much, low damage, low C scaling. Gravelord Sword - This is for dex builds usually...And while it inflicts poison / toxic status on users, it has a low strength scaling of E (and E dex). It can't be enchanted, but at +5 it does 397 damage. Not a terrible weapon, but not ideal for strength build usually, although it does stun lock some enemies. Dragon Bone Fist - The DBF is pretty interesting. It has S rank scaling with strength and a (slow) R2 attack that is hard to block for most. However, the reach is small since it's a fist weapon and the base damage after becoming +5 is only 142. It's fun to play with though -- and weighs only 8. Dragon Tooth - Although fun to use, it's pretty bad. Super heavy, requires a lot of strength (not an issue for a strength build though), and has awful D scaling. Grant - This great hammer has a B strength scale and an A scale for faith, which is pretty darn nice! You can upgrade it to +5, but the attack isn't anything too amazing. Still, not bad to try if you are doing a faith / strength hybrid build. Otherwise, useful @ the catacombs to kill regenerating skeletons. Smough's Hammer - Sure, it heals you by 10 HP when you hit enemies, but the strength scaling is only D. Looks cool though. Great Club - It does 336 damage and has A scaling. A good alternative to this is the Large Club, which has also has a poison auxiliary effect. And just to get it out of the way, here's couple of handful of additional content / DLC weapons that didn't make it for bad scaling: Abyss Greatsword, Great Lord Greatsword. So that's our list of best str build weapons! They have a high damage per second (DPS) and, although slow, deplete the enemy's endurance fast for player vs player (PVP) and player vs everyone (PVE). Yes -- you can stun lock with many of these. And for some of them, you can bash your enemy into the ground or a great distance depending on their stats (such as poise and shield stability). If you feel something here belongs in the list (or doesn't) then please let us know and also why! isn t the zweihander a quality weapon? Nope 🙂 Requires far too much strength. In my opinion, it's a pretty poor weapon. The stat bonuses are pretty low. Considering quality builds go 27(or even 40)/40, the Zweihander is a quality weapon.